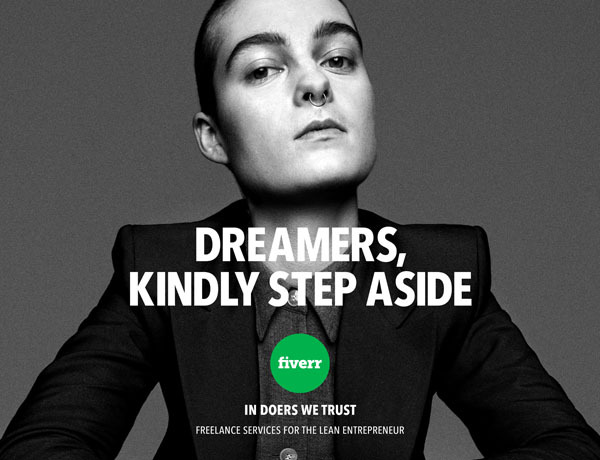 Online marketplace Fiverr and its global agency of record, DCX Growth Accelerator (DCX), today announce the launch of "In Doers We Trust," Fiverr's first-ever brand advertising campaign. The multi-million dollar integrated marketing campaign consists of video, digital, out of home and experiential executions. 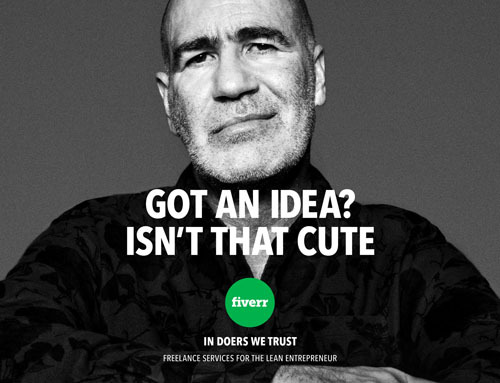 The work is the culmination of a comprehensive brand strategy and creative development process that Fiverr began with DCX in the summer of 2016. "In Doers We Trust" articulates the ethos of Fiverr's current bootstrapping entrepreneur members -- heroizing them -- with the goal of bringing more into the fold. The campaign positions Fiverr to seize today's emerging zeitgeist of entrepreneurial flexibility, rapid experimentation, and doing more with less. It pushes against bureaucratic overthinking, analysis-paralysis, and excessive whiteboarding. "What became clear in our research is that Fiverr users take great pride in being entrepreneurs and identify powerfully with an ideology of lean entrepreneurship," explains Doug Cameron, Founder and Chief Creative Officer of DCX Growth Accelerator. 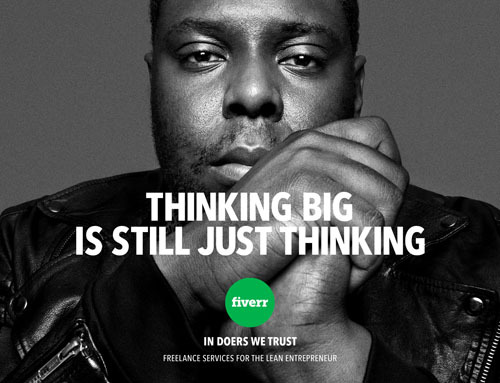 "If you are an entrepreneur, Fiverr is indispensable in that it allows you to compete with much larger businesses. You can use Fiverr to design your logo, build your website, create a video that explains your product, translate this into dozens of languages, and so on, and do this at ten times the speed that it would take a big, bureaucratic company to do it." Adds Peggy de Lange, Fiverr Vice President of Corporate Marketing, "'In Doers We Trust' communicates in a powerful, no-holds-barred way the values and approach our community members and so many others bring to the activity of entrepreneurship. It's an expression of our worldview, and we see it as a rallying cry for millions in our community while building awareness among the countless others that share the same outlook." "Entrepreneurs tend to have an anti-establishment streak, and we wanted to really push this tonally in the creative," DCX Executive Creative Director Tommy Noonan explains. "The campaign's photographers, Platon and Sandro, really embraced this, as did Ryan Hope, our director, who is something of a punk rocker at heart himself." Starting January 9, innovative, brand and product-focused creative campaigns launch on YouTube and Facebook, geo-targeting major entrepreneurial hubs across the United States. Out-of-home creative featuring still visuals of entrepreneurs and real Fiverr community members will begin appearing in key metropolitan rail and mass transit lines, including San Francisco in January, followed by New York City in February. Experiential elements of "In Doers We Trust" including additional out-of-home executions and interactive digital properties will also support the campaign.